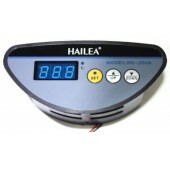 The Hailea HLO-810 Electronic Ozonizer has a high rate of sterilization which is 1.5-5 times as high as UV lamp and 300-3000 times faster than chlorine. This ozonizer has strong effect of killing to most of the gems and organisms. It only use air and oxygen as raw materials, no other additives. The product from the reactor is oxygen which will not be polluted secondly.